If you are into heritage textiles and based in Singapore, you might have heard about author and collector Peter Lee. 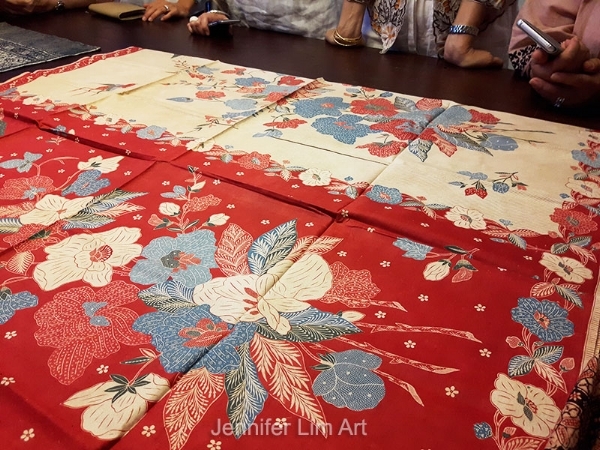 His beautifully presented book Sarong Kebaya - Peranakan Fashion in An Interconnected World is a must for Peranakan culture and fabric fans alike. I was recently lucky enough to take a look at Peter’s studio, where he generously showed some star items from his amazing collection to members from the Textile Enthusiasts Group (TEG). Since the 1990’s, Peter has collected various kinds textiles but mainly 'trade textiles such as Indian Patola cloth, Geringsing and Batik cloth. His collection slowly developed based on a shared love of batik with his late mother, Elizabeth Lee. Peter has since donated numerous pieces to various museums. Singapore, Sarong and Style was an exhibition organised by Peter last year to audiences in Japan. Batik by Eliza van Zuylen. I’ve been particularly interested in sarong since seeing some unusual ones by Indonesian Eurasian batik maker Eliza van Zuylen in a show at the Peranakan Museum several years ago. Peter showed us some examples of her work - and even let us touch them! 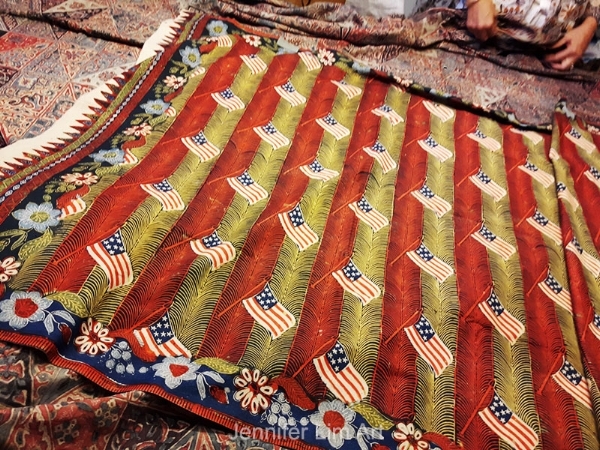 I was also amazed to see a sarong with lots of tropical flowers amid cheerful flags of the United States of America. Peter is one of several prominent Peranakan ‘ambassadors’ helping to enrich the cultural status of Singapore including Peter Wee of Katong Antique House, Raymond Wong of Kim Choo Kueh Chang and Peranakan chef Violet Oon. Textile lovers, and those keen on art and culture, can be thankful for his effort and dedication. We look forward to future exhibitions...not long to wait according to sources! The Textile Enthusiasts Group (TEG) is part of Friends of the Museums, a community organisation offering events and outings to those passionate about culture. TEG can connect you with other people who share an addiction to anything related to fabric, cloth, embroidery or dyeing! From the novice onlooker (me!) to the seasoned collector, you'll find a friendly and supportive community with a wealth of knowledge. For those interested in training to be a museum guide or docent on weekdays, FOM also conducts an intensive and rewarding volunteer programme.